Wildlife officials have experienced an increase in the number of calls reporting coyote sightings in recent weeks across Fairfax County. Coyotes are now established and widespread in Fairfax County so it is important for residents to know and understand a bit more about them in order to safely coexist with these secretive wild neighbors. It is suspected that a few months ago a Maltese on Bradley Circle in Annandale was attacked, dragged outside the fenced in yard in which she had been playing, and killed. Coyotes are medium to large sized members of the canine family, which includes wolves, foxes, and dogs. They have pointed and erect ears, a long, slender snout, and a bushy tail pointed downward. Fur coloration varies from reddish-brown to tan, gray or black with a pale blaze on the chest. The tail usually has a black tip and is held downward while running. 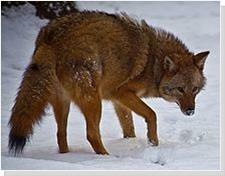 Coyotes average 30-40 pounds but can weigh as much as 60 pounds. Coyotes play an important ecological role as a natural predator that may help to regulate and balance other wildlife prey species that are abundant in Fairfax County. Coyotes are opportunistic foragers with diverse diets that commonly prey on small animals such as rodents and rabbits but will also readily eat reptiles, amphibians, insects, fruits, plants and carrion. Coyotes may also take larger prey such as turkeys and white-tailed deer (primarily fawns). Coyotes are seldom encountered but probably live nearby, even if you haven’t seen them. Pets left unattended outside may be at risk to coyotes, especially during nighttime and early morning hours. Coyotes may mistake small, unattended pets including cats and small dogs as prey due to their similar size to natural prey. Coyotes are territorial and may view larger dogs as a threat. This behavior may be more pronounced during the mating season (January-March) and when coyotes are caring for their young (March-August). Wildlife officials recommend that residents maintain supervision over pets when outdoors and keep them inside whenever possible to reduce encounters with coyotes and other wildlife. 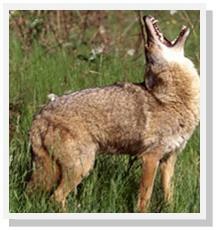 Most coyote encounters in residential areas stem from attractants in the form of available food or den sites. In urban areas, garbage, compost and pet food may become alternative food sources. Feeding or unintentionally providing food for coyotes is a primary concern by wildlife officials as these actions may result in coyotes becoming less wary of humans or cause them to display bold and aggressive behaviors. Unprovoked coyote attacks on humans are very rare. In most cases where coyotes have acted aggressively, a coyote is responding to the presence of a dog, is in close proximity of a den with pups, or has become too comfortable around humans, often a result of people feeding them. Precautions should be taken in areas where coyotes are active to minimize encounters with people and their pets. Preventive practices such as reduction and removal of food attractants, habitat modification and responding appropriately when interacting with wildlife are keys to minimizing the likelihood of conflicts with coyotes. Never feed or attempt to “tame” a coyote. Place garbage and compost in an animal-proof container, such as a metal trash can with latches on the lid or secure with bungee cords. Keep trash inside until the morning of trash pick-up whenever possible. Do not feed pets outside or store pet food outside. Pick up ripe, fallen fruit and do not let it accumulate on the ground. Put away bird feeders at night to avoid attracting small rodents and other coyote prey. Trim shrubbery to ground level to remove hiding cover. Close up all openings under porches/decks, crawl spaces or out-buildings where animals might establish dens. Keep small pets inside and do not leave unattended when outside. Be alert at dusk and dawn. Coyotes are most active at night and early morning hours; however, they may be active during the day in search of food. If a coyote is sighted around your residence, let it know it will not be tolerated. Use hazing techniques to frighten coyotes from the property or exclusion measures to restrict their access in areas where they are unwanted. In some cases, repeat hazing attempts may be necessary to get a coyote to leave an area. Provide secure shelters for poultry, rabbits, and other vulnerable animals.Keep dogs on short leashes (less than 6 feet) while walking outside. Do not run from a coyote. From a safe position, yell and wave your arms at the coyote. Use noisemakers such as whistles, air horns, bells, “shaker” cans full of marbles or pennies, or pots and pans banged together. Throw non-edible objects in the direction of the coyote including sticks, small rocks, cans, or tennis balls. Install motion sensor lights or a motion-activated sprinkler around your home. Install fencing to keep coyotes out of yards. Fencing should be at least 6 feet tall, have an outward slanting overhang or roller-type device to prevent coyotes from climbing or jumping, and have an L-shaped mesh apron buried one to two feet to deter digging. If coyotes are behaving aggressively or appear sick or injured, contact the Animal Protection Police through the Fairfax County Police non-emergency number at 703-691-2131. For additional information on managing wildlife interactions and resolving human-wildlife conflicts, the Virginia Wildlife Conflict Helpline is available toll-free at (855) 571-9003, 8:00AM-4:30PM, Monday through Friday. This helpline is a collaborative effort between the Virginia Department of Game and Inland Fisheries and the U.S. Department of Agriculture – Wildlife Services. Few fences are completely coyote-proof. If these techniques do not solve the problem, Virginia regulations allow nuisance coyotes to be removed by a licensed trapper or critter removal service. It is illegal in Virginia to trap and relocate wildlife to another area.